Concrete really is very beautiful. And you can make amazing structures from it too – the screenshot below from a simple Google Images search is testament to this. Beautiful shapes, structural strength, and a neutral colour which allows focus on form. However, it has serious environmental issues as it produces one tonne of CO2 for every tonne of manufactured cement – the binding ingredient in concrete – explained in detail by The Green Age. Unwanted concrete used to go straight to landfill but is now crushed for gravel or aggregates as the world tries to deal with our unsustainable levels of consumption and waste. Recycling concrete still requires transport and processing, which in turn use finite resources… and why the reuse of the old concrete piers from under our house make me so happy. We have just raised our house. I call it the Tower in the Sky. The concrete piers that were left in the ground varied in size and appearance. Some have smooth edges and some rough. We hired a digger for the day and moved them round the block, forming garden beds and an edging to the new paving area. Around the paving area they have a second use: at 300mm high, these smooth concrete blocks make perfect resting spots. Have a seat. One of the enjoyments in receiving a gift is the feeling of suspense while undoing bows and peeling off wrapping. I rarely use gift bags for this reason; it’s not quite the same to look into the top of a bag and reach in for your treat. When my children were younger our infinite supply of butterfly paintings on butcher’s paper became wrapping paper – bright abstract designs perfect for all occasions (I would set up pots of green, red, gold and silver at Christmas). I’ve always loved the serendipity of butterfly paintings, the beauty in the unplanned splodges and streaks of thick colour with a sprinkling of sparkles thrown in. But the children are not so enthusiastic about getting out the paint pots as regularly as they used to – their crafty exploration time is divided amongst many new endeavours. Yes, this beautiful paper is made from the discarded pages of home magazines. It’s surprisingly difficult to find upcycling examples. I think of it as giving something a second life, but googling ‘second life’ provides a multitude of links to the online virtual world of that name. Whole Living provides us with a way to make gift wrapping bows from magazines. And Brit + Co offer some great ideas to deal with those used mags – check out the drywall (No.6)! Australian Ethical really sums it up with their explanation of the excesses of Christmas and the implications for the environment. They actually like gift bags for that reason, they can be reused – fair point. We all love to give gifts and we all love to receive gifts. A gift that is well chosen is so enjoyable to buy and give, and wrapping it with the same amount of thought is part of the pleasure for me. I think we can still give achieve those qualities while being green. I would love to get a gift that looked like this. I am happy with creating two dimensional works, with years of graphic design honing that skill – and the media is so convenient: if I feel inspired, I can grab a sketchbook and some pencils, or paint from a tube. If I run out, I can buy more the next day (I live in a city). But these two artists must spend months/years collecting enough of their medium to begin and complete their work. In Romanowski’s works above (untitled), there are the everyday objects of cutlery, shoe and timber offcuts, to more difficult-to-find items such as old sheers, cleaver, sculptures, games and countless unidentifiable objects. Although his work is only viewed from the front, and more like a bas relief, I still find it difficult to imagine the designing of the piece when you rely on the pieces you find. I would love to hear about the process. Perhaps similar to one of the grandfathers of mixed media, expressionist Robert Rauschenberg. A total fave. 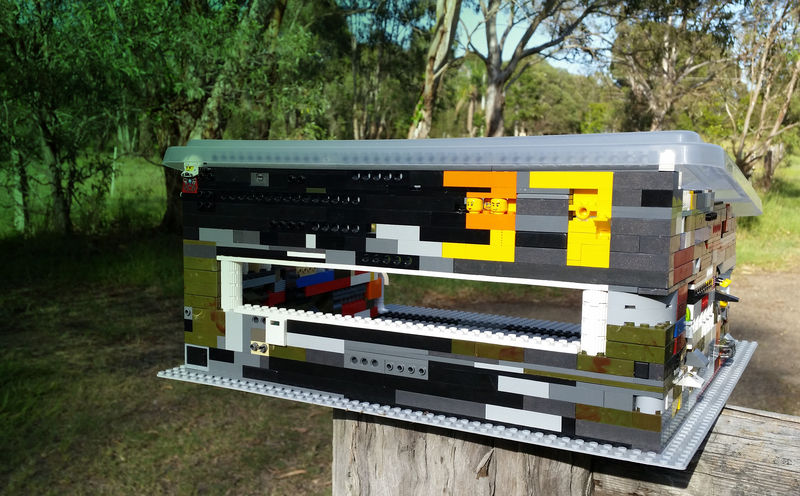 My Lego letterbox is my first sculptural piece from objets trouvés. Not quite art but creative nevertheless, and more designed than spontaneously combined. Not quite Rauschenberg, but a piece I will enjoy using each day when I collect my mail.